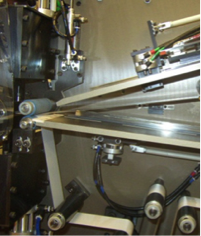 A lithium-ion cell winder used to manufacture 18650 cells that support the Battery Safety R&D program. Sandia has long maintained an energy storage prototyping and fabrication capability in support of its national security mission. As we have expanded our energy storage R&D into areas applicable to commercial applications, we have also adapted this prototyping/fabrication capability as well. We can use this capability to directly support our abuse testing/evaluation and characterization/failure analysis work to study the safety and reliability of the latest cathode and anode materials, electrode designs, additives designed for safety/performance improvements, and state-of-the-art separators. This gives us the ability to help our DOE and industrial partners rapidly develop and produce advanced materials and improved designs. ninety six channels for battery performance testing and formation cycling. 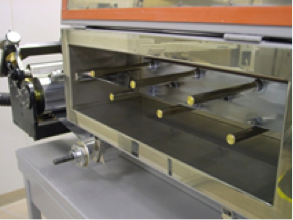 A thin film coating tool used to fabricate electrodes of the most advanced, state-of-the-art materials for lithium-ion cells used to support the Battery Safety R&D program. The prototyping facility staff has extensive experience in electrode design for energy and power cells and experience in coating electrodes and building cells from a variety of active materials include natural and synthetic graphite anodes, Li4Ti5O12, LiCoO2, NMC, LFP, and spinel cathodes (LiMn2O4 and high-voltage LiNi0.5Mn1.5O4).